Castle Burn – RTS Revolution is a real-time strategy game developed by Bluehole PNIX, it is set in a land of fantasy where you face off against others in PvP combat. 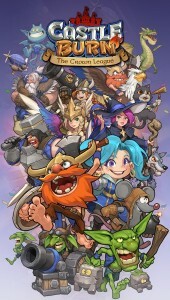 The game features magic, towers, Vikings, and dragons. Lead your heroes’ to victory and burn your rivals’ castles to the ground. Once installed, you will see it on your home screen list of apps. Just simply open it and the first launch will begin to download game resources. Once it completed, you will able to play Castle Burn – RTS Revolution on your computer!